My books concentrate on strategy and organization, creative strategizing, in-depth case studies of various organizations in both the West and Asia, as well as more sociological themes such as organizational discourse. Images and sample chapters are below. Heracleous, L. & El Mekkaoui, N. 2018. How to do your PhD: In a nutshell. KDP. Prange, C. & Heracleous, L. 2018. 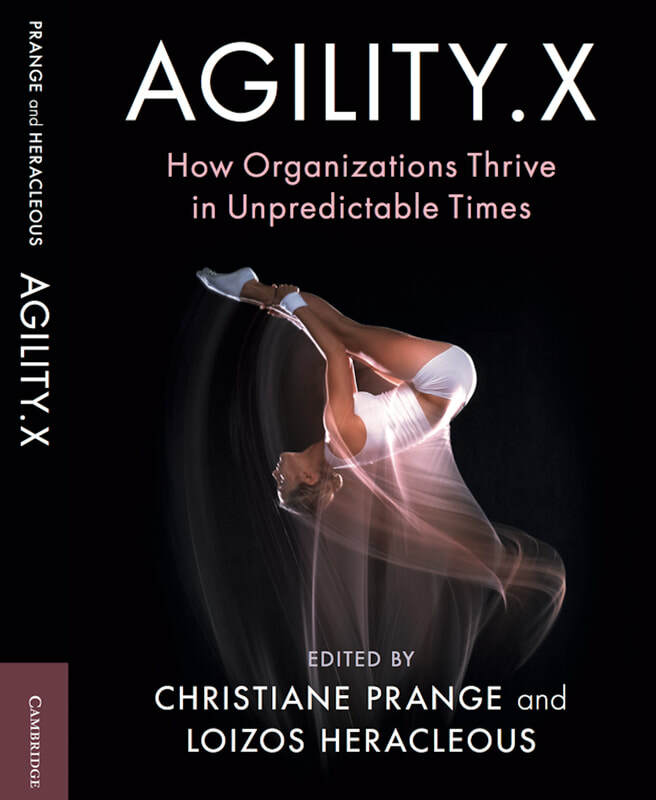 Agility.X: How organizations thrive in unpredictable times. Cambridge: Cambridge University Press. ​& Angwin, D. 2016. Practicing Strategy: Text and Cases. (2nd Edition). London: Sage. Singh, K., Pangarkar, N. and Heracleous, L. 2013. Business Strategy in Asia: A Casebook (4th ed). Cengage Learning (accompanied by volume of instructional notes). Heracleous, L. 2006. Discourse, Interpretation, Organization. Cambridge: Cambridge University Press. Brennan, L., Heracleous, L. & Vecchi, A. 2018. Above and beyond: Exploring the business of space. NY: Routledge. Heracleous, L. & Jacobs, C. 2011. Crafting Strategy: Embodied Metaphors in Practice. Cambridge: Cambridge University Press. Heracleous, L., Wirtz, J., and Pangarkar, N. 2009. Flying High in a Competitive Industry. (Rev. Ed). McGraw-Hill. Heracleous, L. 2003. Strategy and Organization: Realizing Strategic Management. Cambridge: Cambridge University Press. Heracleous, L. 2019. A dialogic perspective on open strategy. In Seidl, D., Whittington, R. & von Krogh, G. (Eds. ), Cambridge Handbook of Open Strategy. Cambridge: CUP. Heracleous, L., Gonzalez, S. & Terrier, D. 2018. Insights from NASA. In The Chief Strategy Officer playbook. Thinkers50 and Brightline Initiative: 110-115. Heracleous, L. 2018. Agility for the strategist: The SLO framework. In Strategy@Work: From design to delivery. Thinkers50 and Brightline Initiative: 147-150. Heracleous, L. 2017. Discourse Theory. In Langley, A. & Tsoukas, H. (Eds. ), The Sage Handbook of Process Organization Studies, Beverly Hills, Sage: 190-203. Morrell, K. & Heracleous, L. 2015. Is shareholder empowerment a “good thing”? In Goranova, M. & Ryan, L. V. (Eds. ), Shareholder empowerment: A new era in corporate governance, Palgrave-Macmillan, 63-79. Oliver, D., Heracleous, L. and Jacobs, C. 2013. Balancing divergence and convergence: Stimulating creativity through hybrid thinking. Bilton, C. & Cummings, S., (Eds.) The Handbook of Management and Creativity, Edward Elgar. Heracleous, L. and Wirtz, J. 2012. Strategy and organization at Singapore Airlines: Sustainable advantage through dual strategy. In Inderwildi, O. & King, D. (Eds.) Energy, Transport & the Environment. London: Springer-Verlag: 479-493. Heracleous, L. 2011. Four propositions toward an interpretive theory of the process of discursive reality construction. In Aritz, J. & Walker, R., Discourse perspectives on organizational communication. Madison: Farleigh Dickinson: 9-31. Heracleous, L. 2008. Globalization. In Gabriel, Y. Organizing words: A creative thesaurus of key words in social and organization theories. Oxford University Press: 118-120. Heracleous, L. and Jacobs, C. 2008. Developing strategy: The serious business of play. In Gallos, J. (Ed.) Business Leadership: A Reader. Jossey-Bass, chapter 25: 324-335. Wirtz, J., Heracleous, L., and Pangarkar, N. 2007, Managing HR for Service Excellence and Cost Effectiveness at Singapore Airlines. In Service Excellence als Impulsgeber - Strategies - Management - Innovationen - Branchen (Service Excellence as Driver - Strategies - Management - Innovations - Sectors), Gouthier, H.J.M., Coenen, C., Schulze, H. S. and Wegman, C., (Eds.). Wiesbaden: Gabler Verlag: 307-328. Heracleous, L. 2007. Interpretive Theory. In International Encyclopedia of Organization Studies, Vol. 2, Clegg, S. R. & Bailey, J. R. (Eds. ), Beverly Hills: Sage: 720-723. Heracleous, L. 2007. Hermeneutics. In International Encyclopedia of Organization Studies, Vol. 2, Clegg, S. R. & Bailey, J. R. (Eds. ), Beverly Hills: Sage: 582-585. Marshak, R. J. and Heracleous, L. 2007. Organization Development. In International Encyclopedia of Organization Studies, Vol. 3, Clegg, S. R. & Bailey, J. R. (Eds. ), Beverly Hills: Sage: 1047-1052. Heracleous, L. and Fellenz, M. 2005. On the applicability of “alien” concepts to organizational analysis: Some criteria for inter-domain conceptual transfer. In Linstead, S. and Linstead, A. (Eds.) Thinking Organization. London and New York: Routledge: 97-111. Heracleous, L. 2004. Interpretivist approaches to organizational discourse. In Grant, D., Phillips, N., Hardy, C., Putnam, L. and Oswick, C. Handbook of Organizational Discourse. Beverly Hills: Sage: 175-192. Heracleous, L. 2003. The ethical role of the board and governance reforms in Singapore. In Tay, S. S. C. & Seda, M. (Eds. ), The Enemy Within: Combating Corruption in Asia. Eastern Universities Press. Heracleous, L. 2000. Singapore. In Privatization Experience of Asian Countries. Asian Productivity Organization, Tokyo: 157-170.